REPUBLIKA.CO.ID, JAMBI – Alihfungsi hutan di Provinsi Jambi menjadi ancaman serius bagi kehidupan orang rimba atau biasa disebut suku anak dalam. “Alihfungsi lahan yang membabi buta menjadikan ruang kehidupan orang rimba di Jambi semakin sempit. Kondisi ini menyebabkan konflik humanistik,” ujar Direktur Komunitas Konservasi Indonesia (KKI) Warsi, Rakhmad Hidayat, di Jambi, Rabu (11/1). Menurut dia, alihfungsi kawasan hutan baik oleh perorangan maupun perusahaan di Jambi sudah terjadi sejak dua dekade terakhir. Warsi Jambi mencatat lebih dari 853.430 hektare kawasan hutan di Jambi beralihfungsi dan dikelola perusahaan melalui izin HTI maupun HPL. “Jumlah itu belum ditambah alihfungsi oleh masyarakat untuk dijadikan perkebunan seperti sawit dan karet. Selain menimbulkan degradasi hutan, kondisi ini juga sangat riskan menimbulkan konflik kemanusiaan. Khususnya bagi orang rimba Jambi,” jelasnya. Lebih lanjut dia mengatakan, orang rimba Jambi menempati beberapa daerah pedalaman kabupaten di Provinsi Jambi seperti Kabupaten Batanghari, Tebo, Sarolangun, sebagian Kabupaten Bungo dan Kerinci. Indonesia exempted 3.6 million hectares of forests and peatlands from protected status under its two-year moratorium on forest concessions, according to a revised version of its moratorium map released near the end of climate talks in Durban. The new Indicative Map includes 10.7 million hectares of peatlands, down from 15.5 million hectares in the previous version of the map that defines areas off-limits for new concessions. Some 1.2 million hectares of previously unprotected “primary forest” has been added to the moratorium area, resulted in a net decline of 3.6 million hectares under the moratorium, according to analysis by Daemeter Consulting, an Indonesia-based forestry consultancy. Daemeter says some of the changes appear to reflect the “inclusion of pre-existing licenses not accounted for previously in the original map”. Most of the reclassified area is oil palm concessions on peatlands. Under its self-imposed moratorium, Indonesia permits the Ministry of Forestry to revise the Indicative Map based on field evaluations. Daemeter says further reduction in moratorium area “is expected in future six-monthly revisions as increasing numbers of pre-existing licenses are registered”. The changes partly reflect the chaotic state of Indonesia’s concession allocation system. Oil palm plantations are typically granted by local authorities, rather than the central government, making accounting more difficult than for timber concessions allocated by the Ministry of Forestry. But Elfian Effendi of Greenomics said business interests may also be a factor. 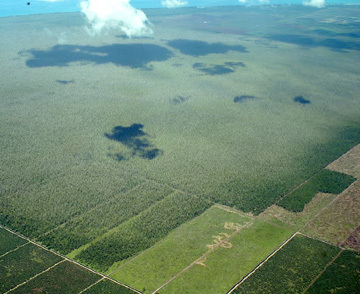 A large portion of the remaining Tripa peat swamp forests photographed in August 2008. In the foreground are planted and unplanted oil palm blocks, with further blocks being drained before clearing. These blocks have now already been cleared. Image courtesy of Tim Koalisi Penyelematan Rawa Tripa. “Forestry law and regulations in Indonesia are primarily designed to accommodate business interests, rather than accommodate the interests of our forests and forest communities,” Effendi told mongabay.com via email. Indonesia’s forest moratorium is part of President Susilo Bambang Yudhoyono’s 7/26 initiative, which targets 7 percent annual economic growth and a 26 percent reduction in greenhouse gas emissions by 2020 relative to business-as-usual. Reducing deforestation and peatlands degradation is the centerpiece of his push toward low carbon development. However the president’s efforts have been fiercely opposed by politically-powerful interests in the forestry sector, which have lined up behind the Ministry of Forestry and other agencies against Yudhoyono’s REDD+ Task Force, the agency charged with reforming the country’s forest management practices and institutions. These interests successfully weakened the moratorium, which was originally supposed to include all forests but now has gaping loopholes and only applies to “primary forests” and peatlands. Pre-existing concessions in peatlands and old-growth forests are exempted. 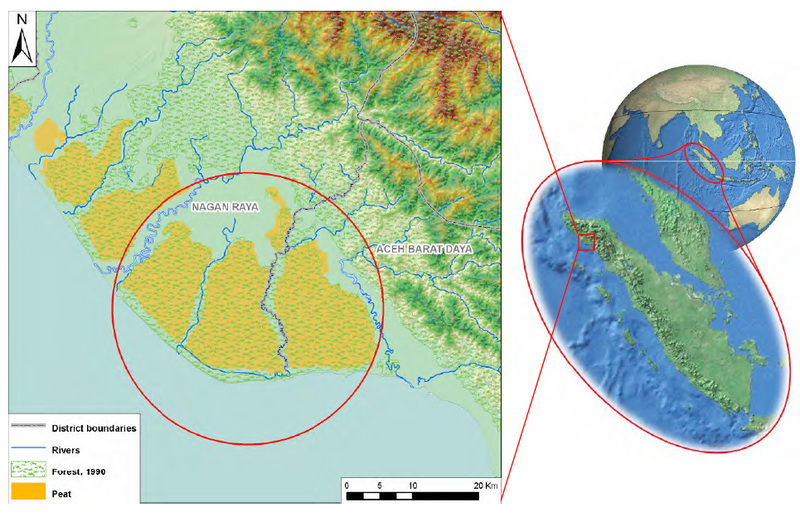 The location of the Tripa peat swamps (circled) on the west coast of Aceh province, northern Sumatra, showing rivers, forest cover in 1990, peat, and district boundaries. Tripa is the site of a controversial new oil palm plantation that has could put Aceh’s governor in prison. Image courtesy of Tim Koalisi Penyelematan Rawa Tripa, a coalition of community groups seeking legal action against the governor. The new revision however does not let Aceh Province’s “green” governor off-the-hook for an oil palm plantation slated for development in the heart of Tripa peat swamp, an area that has the highest concentration of Sumatran orangutans. While the new Indicative Map shows an exemption for the 1,600-hectare plantation under the moratorium, groups contesting the development say it violates other regulations, including at least two laws and a prior commitment by Aceh Governor Irwandi Yusuf to impose his own moratorium in the province. “The criminal report submitted to the Criminal Investigation Office at Police Headquarters is based on the facts and the consideration that the issuance of this particular license contradicts Government Regulation PP. No 26/2008 on the National Spatial Plan. Based on the PP No 10/2008, the Leuser Ecosystem is designated as a protected area with the status of a National Strategic Area. Therefore, issuance of oil palm plantations that are located within the Leuser Ecosystem and peat swamp areas is clearly a criminal act,” said Kamaruddin, a lawyer representing the Coalition of Communities Concerned for Tripa, a group that is suing the governor for abuse of power. The coalition says Governor Irwandi could face up to five years in prison if found guilty of the charges. The controversy surrounding the Tripa permit caught some by surprise — Irwandi has been a champion of forest conservation in Aceh and is seen as a leader of efforts to link climate finance to forest protection through the Governors’ Climate and Forests initiative. But as Agus Purnomo and Yani Saloh, special advisers to President Yudhoyono on climate change, recently noted in an editorial in The Jakarta Globe, international financial support for reducing emissions from deforestation and degradation (REDD) programs has been slow to materialize on the ground in Indonesia. “The province of Aceh has had a moratorium on logging for more than four years, but has still received no REDD money to compensate for its efforts,” they wrote. 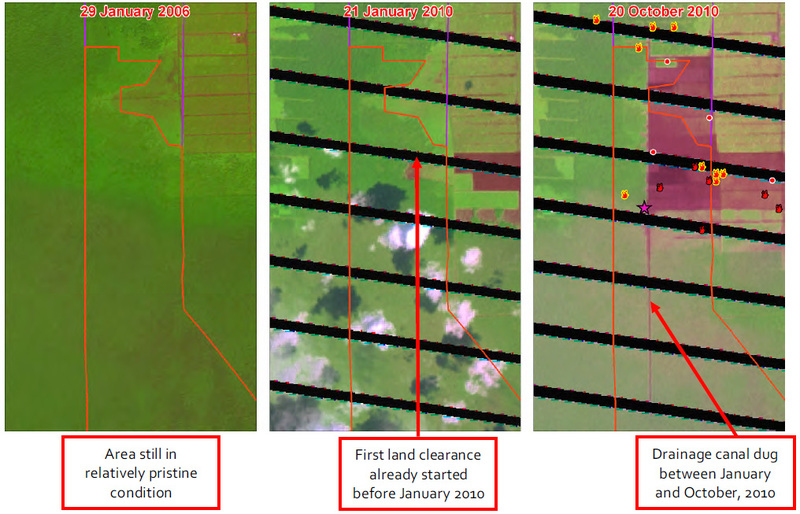 Northern section of the new concession plotted on a time series of satellite images (Spot 5: 29/1/06; Landsat 7: 21/1/10 and 20/10/20) showing damage to the area before the concession permit was ever issued. The purple star on the right hand image are orangutan nests photographed on 11/11/11. Red flames with yellow border are fire hot spots in 2011, red flames with black borders are those in 2009 and 2010, and the small red dots are fire events 2001 to 2008. 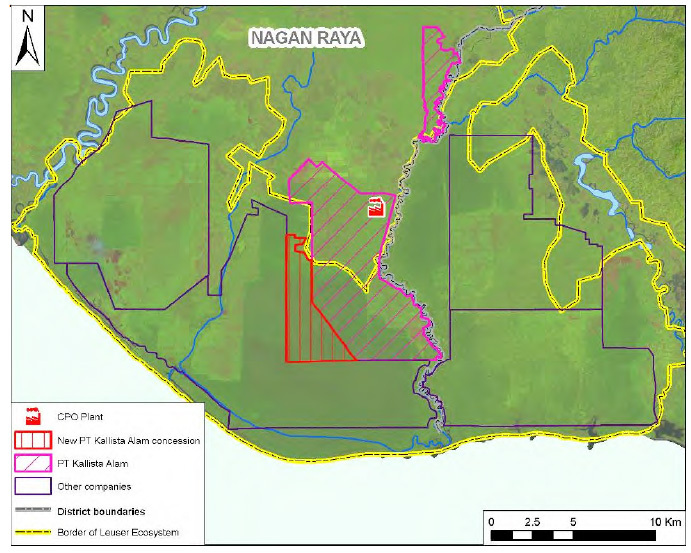 The 2 original concession areas of PT Kallista Alam (shown in pink hatching) and “new” concession (in red) in the Tripa peat swamps, on a 2006 satellite. Images and captions contained in Tripa Truths, a report produced for Tim Koalisi Penyelematan Rawa Tripa. Tim Koalisi Penyelematan Rawa Tripa (2011) Tripa Truths [PDF]. Legal confusion surrounding the management of land resources has resulted in conflict between businesspeople and locals, which at times has ended bloodily, agrarian experts have said. Arie Hutagalung, the University of Indonesia’s expert on agrarian affairs said that when deliberating the 2004 Law on Plantation, the 2009 Law on Mineral and Coal and the 1999 Forestry Law, the government and the House of Representatives had failed to make reference to the Agrarian Law of 1960. “For instance, the Plantation Law opens the door for the local administration to give a permit for private companies to manage up to 100,000 hectares. The Agrarian Law meanwhile stipulates that it should be no more than 20,000 hectares,” she said. Arie said that there was also a clash between the Agrarian Law and the three laws on the issue of rights for indigenous communities. “The Forestry Law does not recognize the rights of indigenous communities, something that has been clearly regulated by the Agrarian Law,” she said. Iwan Nurdin, campaign deputy for the Consortium for Agrarian Reform (KPA) said that the three new laws were endorsed to secure the interests of the business community. “Agrarian politics in those three laws is based on the interests of investors. Those laws close access to land for the local people,” he said. He said that the Forestry Law was clear in its stipulation on what the central government and local administration could give as compensation to companies. The same also went for both the Plantation Law and Mineral and Coal Law, he said. “When the two laws allow for the forest to be given as a concession, they fail to take into account the presence of the local community that relies on the forest for their livelihood,” he said. As a solution, Iwan said that instead of appointing big companies to manage the concessionary land, the government should start trusting local communities to manage them. Data from the KPA said that there were 163 agrarian conflicts during 2011. Two weeks before the Bima riot on Saturday, the public was shocked by the alleged mass killing in Mesuji, Lampung, allegedly over the encroachment of traditional land by private companies. Of the 25 million hectares of productive forest concessions (HPH), more than 8 million hectares were under the industrial forest concession (HTI) scheme and 12 million hectares were given to palm oil companies. Arie said that to prevent future conflicts, local administrations should show more accountability to the local community. Private companies should also fulfill their obligations in finding new lands for local people whose land would be occupied before the companies started their operations. In the mining sector, companies should also reclaim land, upon which they would run their operation. She also said that it was not always a sad story for local communities. She said that in Bengkulu, a private company only needed to make a verbal request to locals who would later give up their land for commercial projects. “It depends on the political will of politicians and government officials. They should work together to carry out agrarian reform,” she said. Iwan said that the government should refrain from issuing new agrarian-related regulations before conducting a thorough review on the four laws.